I love pie. It’s always been one of my favorite things to bake. It’s so much better than cake IMO. I’m a crust fiend. Gimme all the crust. 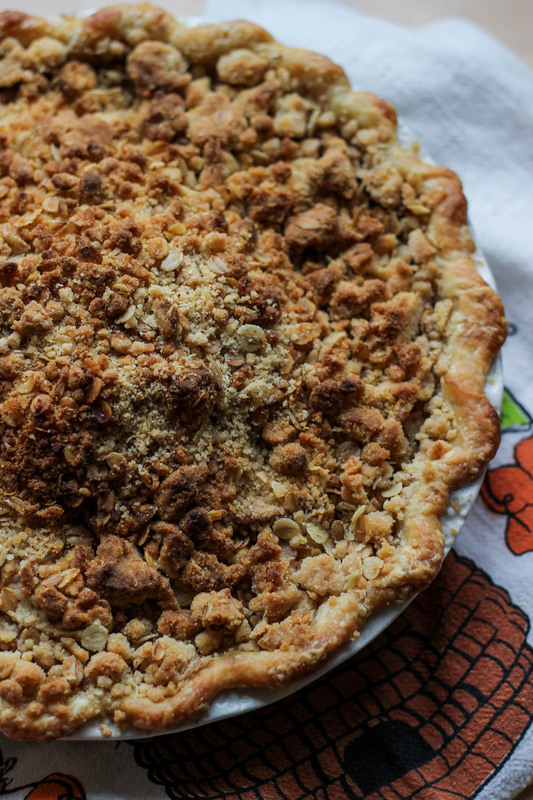 I have to admit, growing up I was known to sneak into the kitchen and steal pieces of crust off the pies my mom made. There are photos for proof. Embarrassing. No shame tho. That’s why making crumble pies are always a struggle for me. It’s hard for me to justify giving up the top crust. I love it too much. 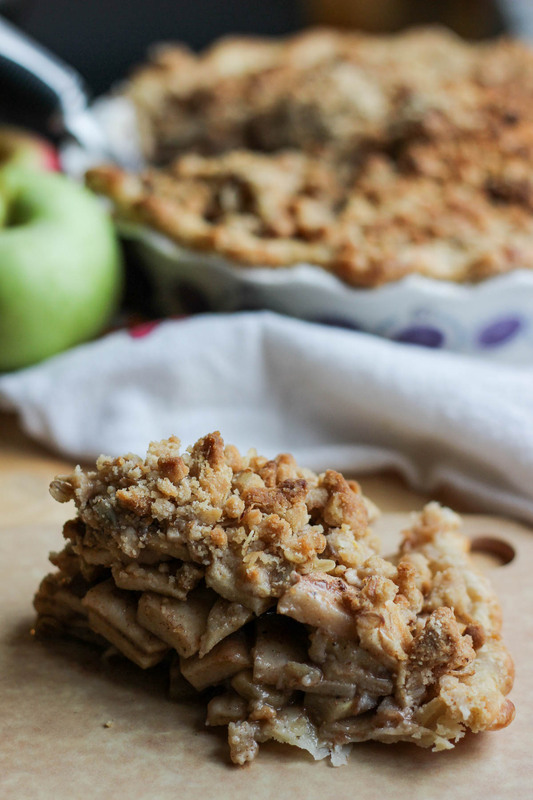 Buuut I will say, I also do enjoy me some crumble topping too, and this one is my favorite crumble recipe! I use it on coffee cake, all sorts of muffins. 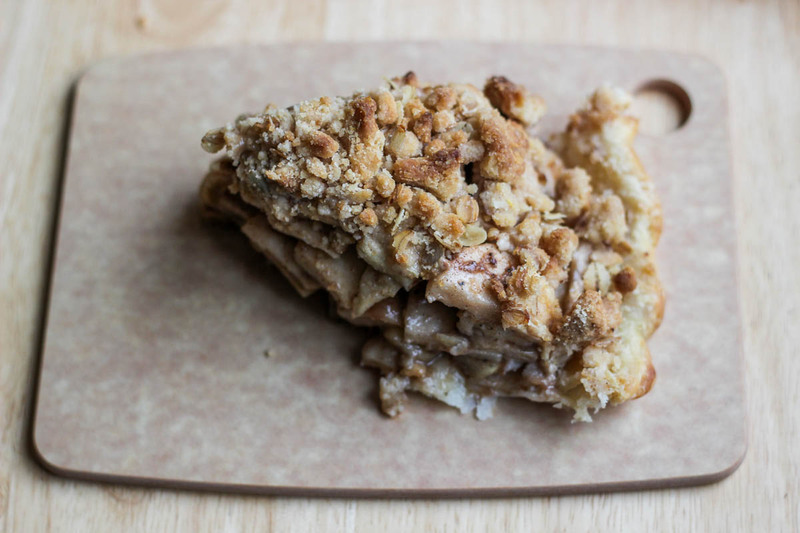 Anything that needs a crumb topping, this is the perfect one. 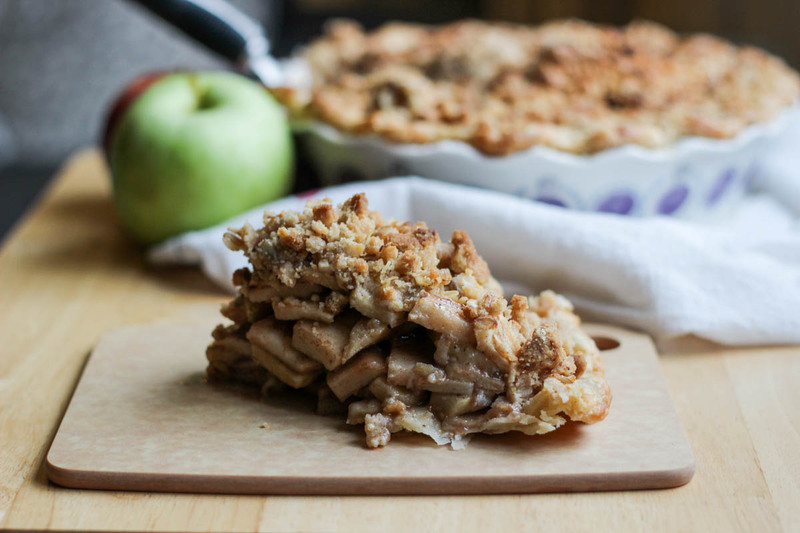 The chai spices in this pie are so warm and earthy, and they pair perfectly with these delish apples. I mentioned in my last post of this tasty Apple Cinnamon Bread that I went apple picking at an orchard outside of Pittsburgh. So I have tons of apples to use up. 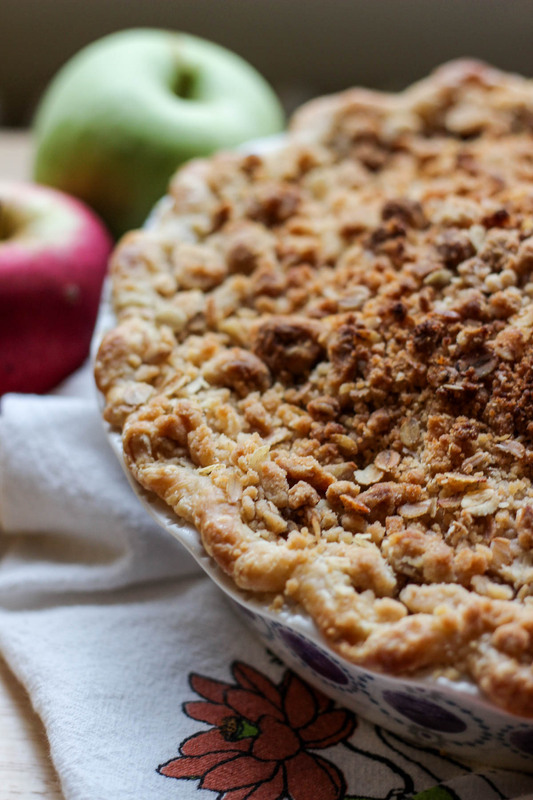 Cue the pie! 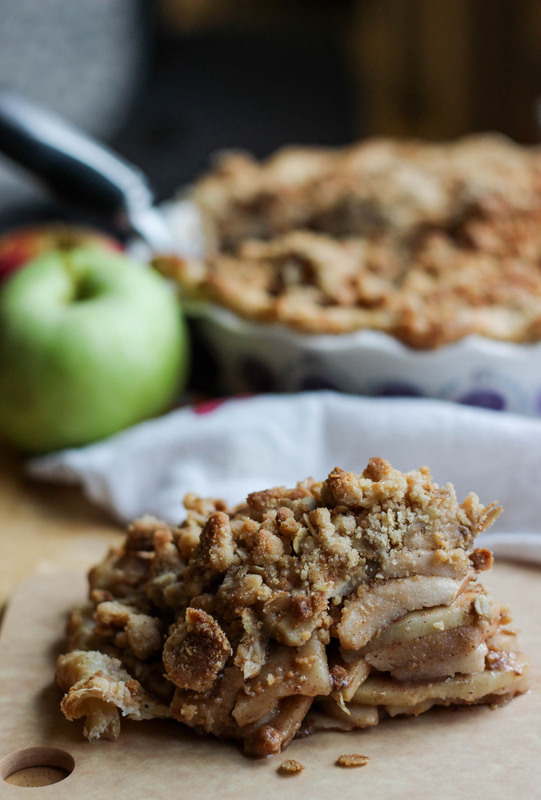 A twist on the classic apple pie, chai spiced with a crumble topping. 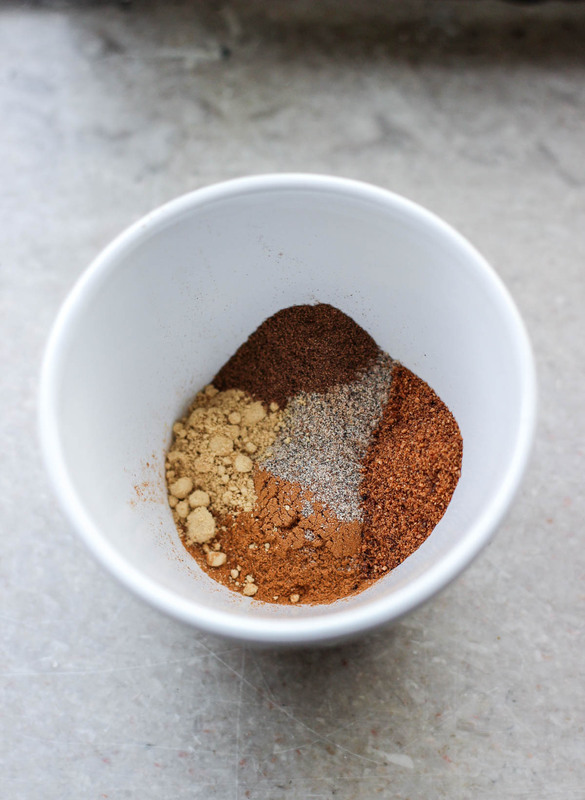 Crumble: In a small mixing bowl, combine the sugars, cinnamon and salt and whisk together. Slowly pour in the melted butter and whisk until incorporated. Then add the flour, and mix with a rubber spatula until it combines into a coarse crumble. Feel free to use your hands to squeeze bits together to form bigger crumbs. 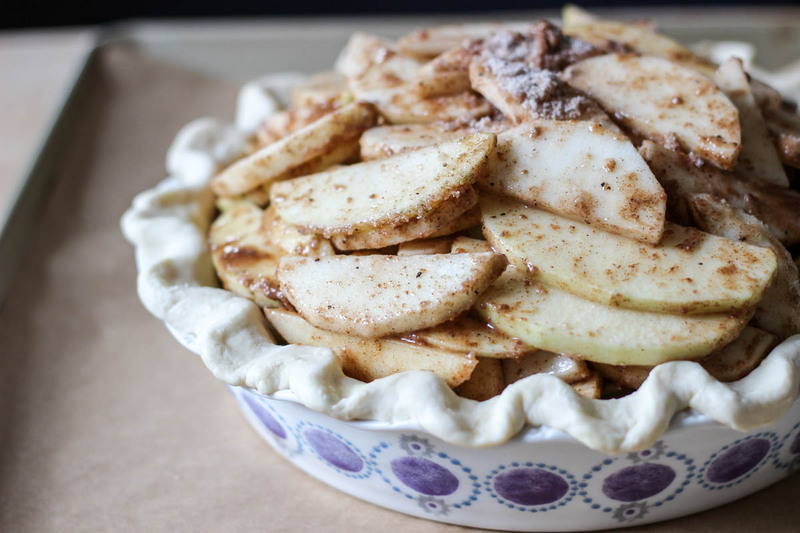 Spread out on to a baking sheet and refrigerate until firm. 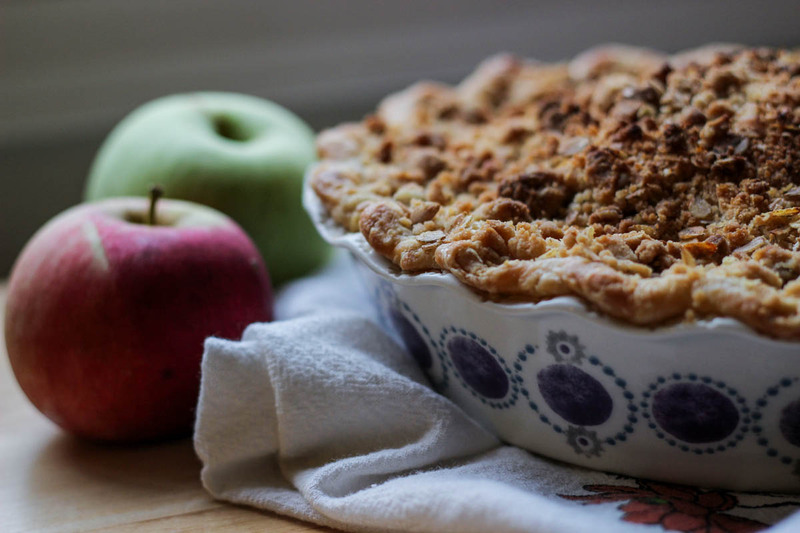 Crust: In a mixing bowl, combine the dry ingredients. Combine water, ice & vinegar in a measuring cup. Cut in the butter into the dry ingredients with a pastry blender until pea-sized. Drizzle over 1 tablespoon of the liquid, and mix together with a spatula. Continue adding one tablespoon of liquid and mixing until it comes together into a shaggy dough. 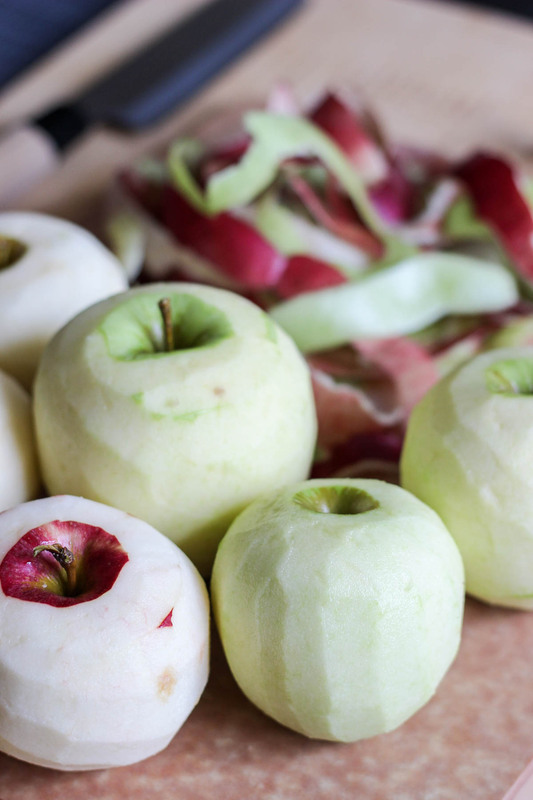 Shape into a disk, wrap in plastic and refrigerate for at least an hour (or overnight). Assembly: Preheat the oven to 400 degrees. 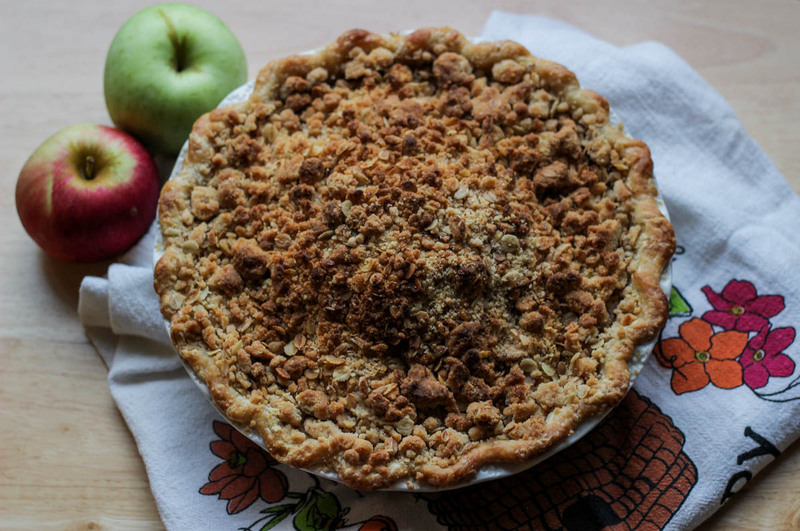 Roll out the pie dough on a floured workspace to 1/8 inch thickness, or big enough to fit in your pie pan. Place in the pan and crimp the edge to your liking. Freeze the ready crust for 15 minutes. 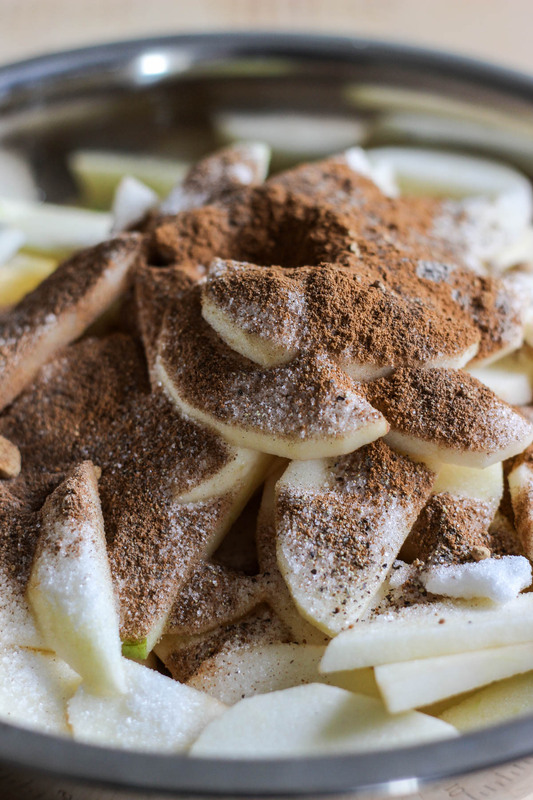 Combine your filling spices, sugar and flour in a mixing bowl with the apples. Toss to coat. 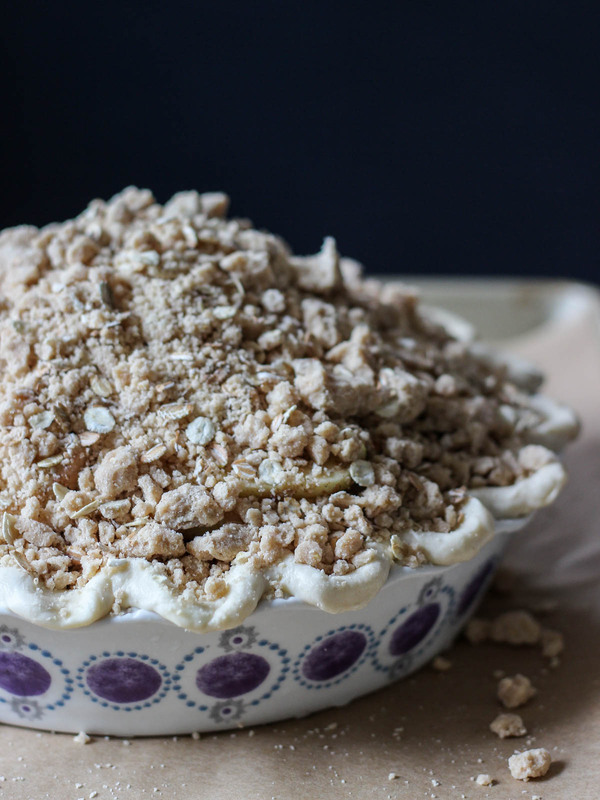 Pour the filling into the crust, and top with as much crumble as you can, or to taste (I piled mine hiiigh cuz more crumble=better pie IMO). Bake for 20 minutes, cover with foil and lower the oven to 350. 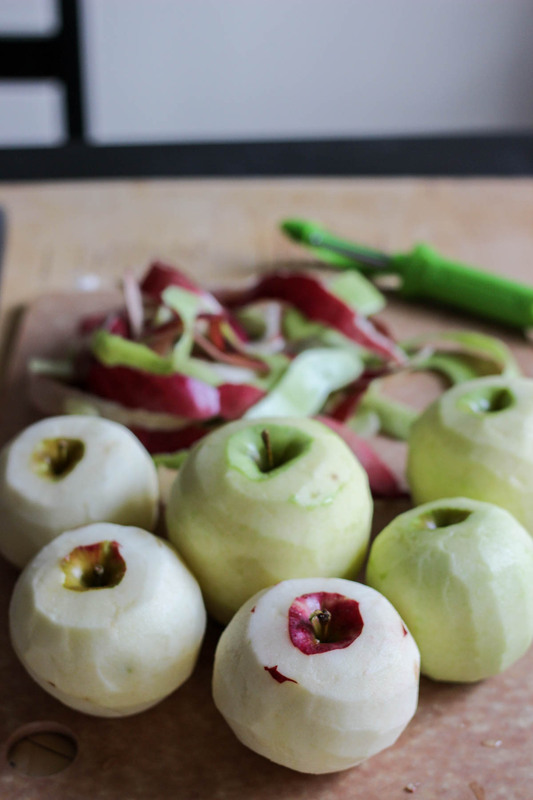 Continue baking for 30-45 minutes until the crust and crumble are golden brown, and the apples are bubbling. Cool on a wire rack before slicing. 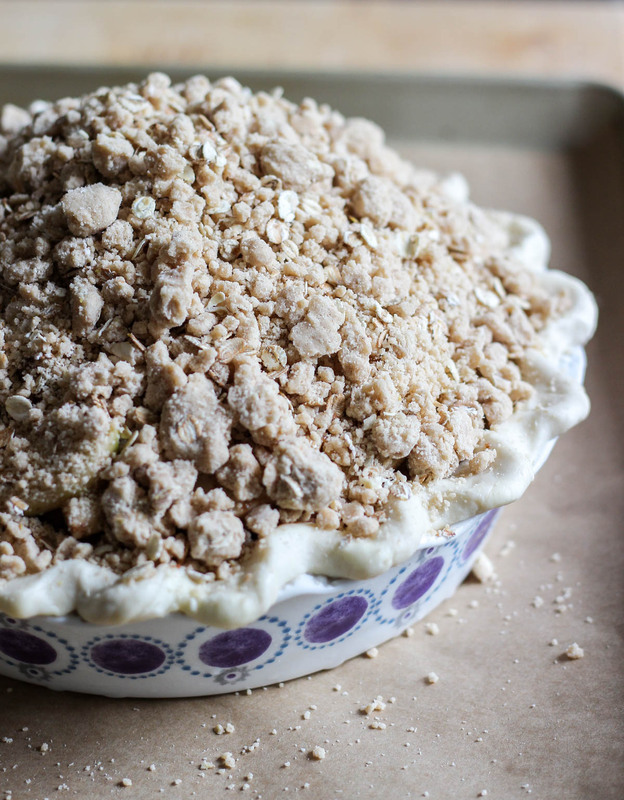 The crust & crumble can be made days in advance and frozen or refrigerated. If freezing, just transfer the crust to the fridge overnight before use. I also complained in my last post about how hot it’s been since we arrived here in August. Welllp, mother earth heard me and Fall has finally arrived with a vengeance. The last couple days have been in the 40s!! That’s a 40 degree drop from just a few days ago! I don’t know if I’ll ever get used to the erratic east coast weather. 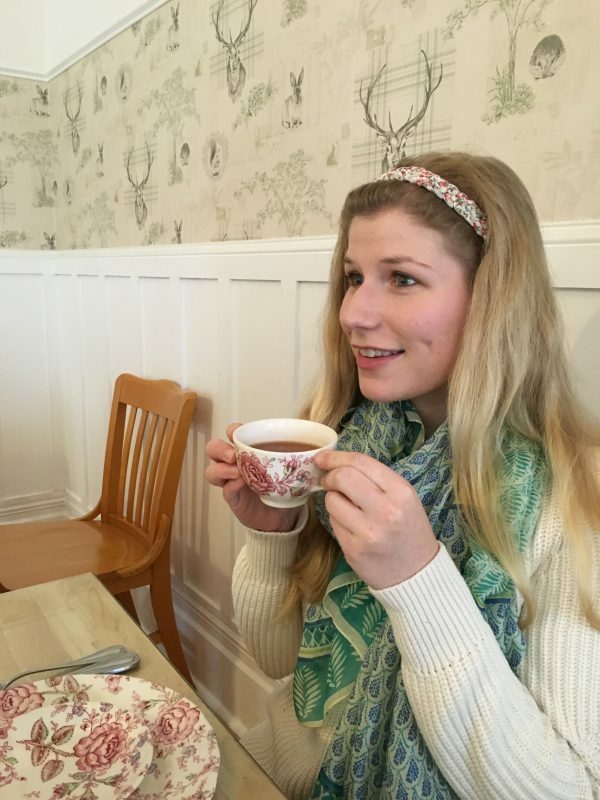 But it means I can be cozy, drink lots of tea, and eat pie so I’m happy for now. Still pretty scared for what winter will feel like here. Eeep.